Giga-discount-pneus_fr the leader in tires online at discount prices !! price per unit for immediate purchase: winter aluminum wheel bmw 3 cabrio 3c 225/45 r17 91v goodride. 1x winter tire goodride sw608 225/45 r17 91v 1x aluminum rim 7.5x17.0 and35. Please note that delivery is free. The new sw608 goodride guarantees better control in all winter conditions. Its directional profile allows excellent traction on snowy or icy roads. The transverse grooves effectively divert the water and thus repel the risk daquaplanning. Its rubber compound is developed for more grip and better braking on winter roads. Speed ​​index: v: max 240 km / h.
Date of production: current production. Size (in inches): 7.5x 17.0. Offset (in mm): and 35. Number of holes / center distance (in mm): 5/120. The complete wheels, a choice of quality, because the tires are already mounted and balanced on the rims. The offer includes 1x tires on aluminum rim, incl mounting kit (see special conditions). Before ordering, pay attention to the fact that it is not possible to change aluminum rims with steel rims only if you have access from the producer. It is essential to respect the original dimensions. If you want to change the tire size, consult the producer of your vehicle before. Labeling ue tires / efficiency classes. 1222/2009, the European Union has introduced tire labeling, which is mandatory and identical for all EU member states. This is valid for automotive tires, for light and heavy commercial vehicles manufactured after 01.07.2012. Tires are classified in tire labeling according to three performance characteristics: fuel efficiency (letters a to g), wet soil adhesion (letters a to g) and external noise emission (decibels). Labeling is not valid for the following types of tires: retreaded tires, off-road professional tires, road tires, tires provided with integrated devices to achieve better traction, such as spike tires, spare tires type t, special tires for fitting on vehicles, registered before 1 October 1990, tires with a maximum permissible speed of 80 km / h, tires with rims having a nominal diameter of less than or equal to 254 mm or greater, or Well, equal to 635 mm. Through this ordinance, the aim is to promote, on the one hand, economic and ecological efficiency in road traffic, as well as to increase safety in the street and, on the other hand, to offer the consumer more transparency about the product, by serving at the same time time as an active partner in decision-making. Experts criticize the fact that the EU tire label reflects insufficient product information. Tires have several very important product characteristics and safety editors, such as slippage, rolling stability, service life, wet and dry road braking characteristics, winter weather behavior and so on. The manufacturers draw attention to the fact that the results of the tests carried out by various institutions and specialist journals still remain an important means of information for the final consumer. These generally check not only the three characteristics of the products, listed on the EU tire label, but also other 11 characteristics of the product, noticeable from the point of view of safety. About us: we are the European leader in selling tires on the internet - n ° 1 !!! Trust us, more than 10 years of experience and already millions of satisfied customers. Does the wheel work on the car? Attention - before adding to the cart the product make sure that you have respected the coordinates corresponding to the registration of your vehicle. Thank you for using our bank details (and not those debay). On delivery: for 90% of orders, we deliver within 3 days after receipt of payment. We are committed to delivering in less than 6 days. Unfortunately, in case of high demand or shortage, we will contact you to keep you informed. Comment: Please confirm the details of your invoice and delivery address before sending your order. Once the contract between us and you has been concluded (the invoice detail), upon receipt of payment, these details can not be changed. Moreover, according to the law, the invoice, once discerned to the customer, can not be changed. Note that in case of unavailability of the ordered product, we can deliver tires with load index or higher speed (for the same price). Other questions: we would be happy to answer you. Or call us: +33/975180672 (Mon-Fri 7 am - 10 pm). The item "winter wheel bmw 3 cabrio 3c 225/45 r17 91v goodride with rim 7.5x17.0 and35" is on sale since Thursday, June 22, 2017. It is in the category "auto, motorcycle parts, accessories \ auto \" tires, rims \ complete wheels ". 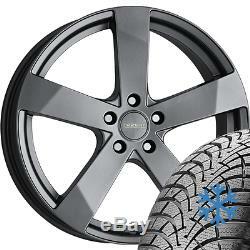 The seller is "giga-discount-pneus_fr" and is located in hannover, germania. This item can be shipped to the following country: France.